Renaissance tapestries did more than glorify power (though they did plenty of that, too). Here comes your man: Alexander Entering Babylon in Triumph (Charles Le Brun, designer). The wall tapestry is an art form stigmatized enough to have become something of a trope -- the sort of thing owned by the idle aristocrat, and tailored to glorify those in power. Gods, Love and War, an exhibit of work from the Renaissance, doesn't exactly insist otherwise. But this show, culled from the Carnegie Museum of Art's collection, does observe that such items might carry serious aesthetic weight, and be based largely in a more popular visual language. Tapestries of this size aren't created by a single artist, and they're completed over a long period of very deliberate labor. Squads of weavers at Northern European manufacturers worked for months, if not years, from a preconceived image. 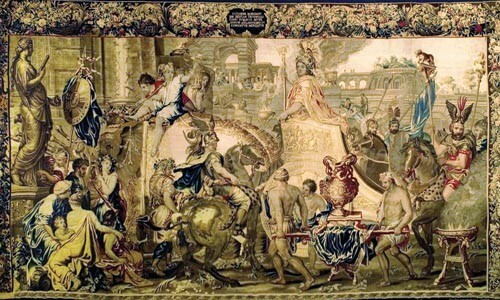 The most striking tapestry in the show, a late-17th-century production characteristic of the pictorial evolutions of the Baroque, is Alexander Entering Babylon in Triumph. The figures of soldiers, handmaidens and horses bend and careen to make way for the conquering warlord. Their jutting limbs are accurately foreshortened. Billows of smoke and gowns blow convincingly in the breeze. Touches of naturalism notwithstanding, the scene is impossibly opulent, with Alexander, angelic and placid-faced, towering over the bustling milieu in his gargantuan gold chariot. The tapestry was woven after a design by Charles Le Brun, court painter to Louis XIV. As the wall text will tell you, the Sun King sought to identify himself with Alexander, one of the "Nine Worthies" -- historical figures of legendary proportions. As a common symptom of the increase in royal patronage around this time, the deftest painters and designers consigned their skills to elevating monarchs and generals to near godhood. Few rulers, of course, were fonder of aligning themselves with glory than Louis. Most of the other tapestries are far more humble, if not almost populist in theme. Autumn and Winter, the two oldest, feature robust peasants in communal work and play. The rigidity of the composition and the almost diagrammatic positioning of the figures around the action seem practically instructional, like a how-to-serf guide. The exhibit's six tapestries are surrounded by prints and drawings that echo the somewhat dogmatic image-making. Cautionary tales abound in Breughel's depictions of abstract virtues and vices, armies of outsized men ever at odds with loping, reptilian tormentors. A painter and draughtsman, Breughel is in these fantastic depictions an indirect source for the often sprawling, demon-riddled scenes of a fair number of contemporary local artists, like Ben Kehoe, Chris Kardambikis and Jeremy Bechtol. Whereas their pictorial content is intentionally convoluted, Breughel's work was designed to be immediately legible, like that of his relative contemporaries Mantegna and Durer -- sometimes to the point of presenting a moral myth or parable. This didactic range is rendered clearly in two smaller pictures of the god Bacchus. Revelry is at its height in each, though with moderate editorializing. While Philibert Benoit-Delarue's booze-soaked caravan is a boisterous but benign affair, Jan Theodor de Bry's tighter line-work articulates a much more corpulent, unruly wine-god, some general confusion and at least one puking satyr. Delarue's approach is breezily illustrative, while de Bry's is darker and more admonishing, echoing the moral tinge of the larger tapestries. In considering the exhibition as a whole, meanings are a little scattered. The tapestries have diverse origins, and thus lack a common thematic thread. However, the supplementary prints and drawings help the viewer suss out the unifiers and the variations in work that was meant to be declarative and unequivocal. And even outside of that context, the images themselves are striking enough to agitate the heartstrings, or inspire the viewer's fear of a vengeful God.